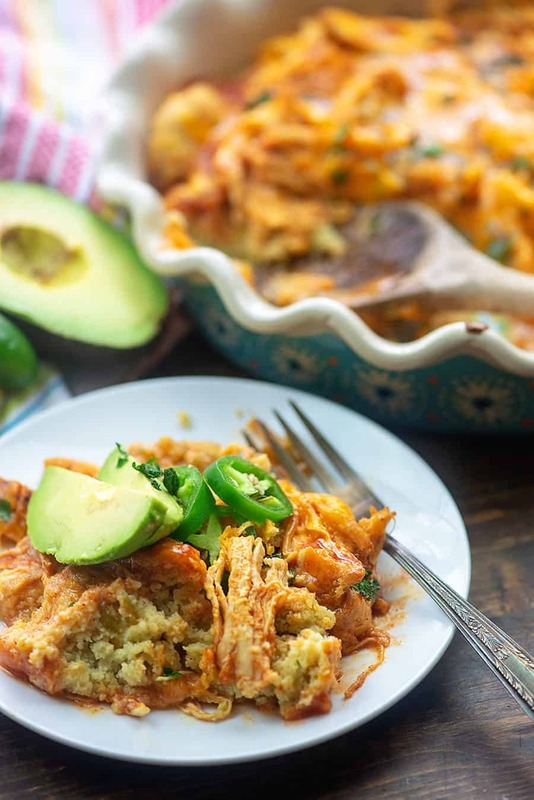 Tamale pie that tastes like the classic tamale casserole, but with ZERO corn and just 8 net carbs per serving! This low carb Mexican recipe is a total hit with my family and it’s perfect for serving up on Mexican night! I believe I’ve mentioned before that I have a thing for Mexican food. It’s my favorite cuisine! I often eat taco salads made with my crockpot chicken fajitas for lunch. When we go out to eat, I nearly always order steak fajitas and ask them to hold the tortillas. I just add the toppings to the tortillas, drizzle on a little queso, and eat it with a fork. So filing and it totally feels like a cheat meal. Lately, though, I’ve been craving tamales. I knew that my low carb cornbread (made with ZERO corn) would be the perfect starting point. My family can’t even tell the difference between real cornbread and my low carb version – it’s THAT good. Ready for the how to? To start, we’re going to whip up my ‘corn’ bread recipe. 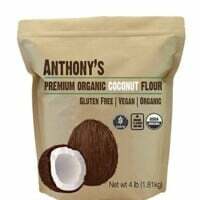 You’ll need some butter, cream, eggs, coconut flour, sweetener, baking soda, and a little salt. Easy enough, right? 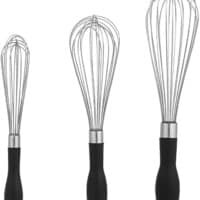 Whisk all that together to form a nice batter. The batter is fairly thick, but should spread well enough into a greased 9 inch pie plate. Bake the cornbread for about 15 minutes – it shouldn’t be completely cooked through as it will be going back in the oven, but it should be just about set. Grab a fork and poke holes all over through the cornbread and drizzle on some enchilada sauce. You can use a homemade sauce (I’m still perfecting mine, but I’ll share when it’s done!) or you can use a can from the store. I would recommend looking for a brand that has 4 carbs per 1/4 cup…that’s the lowest I’ve found. Drizzle the enchilada sauce over the cornbread and then top it off with some seasoned chicken. Add lots of grated cheddar and pop it all back in the oven for another 10 minutes. What comes out is hot, steamy, cheesy, Mexican goodness. You’re going to love it! This dish is serious comfort food. It’s easy, it’s quick, and it will make even the carb-lovers happy. If you guys give this a try, be sure to share on Instagram and tag me @that.low.carb.life! I love seeing your creations! 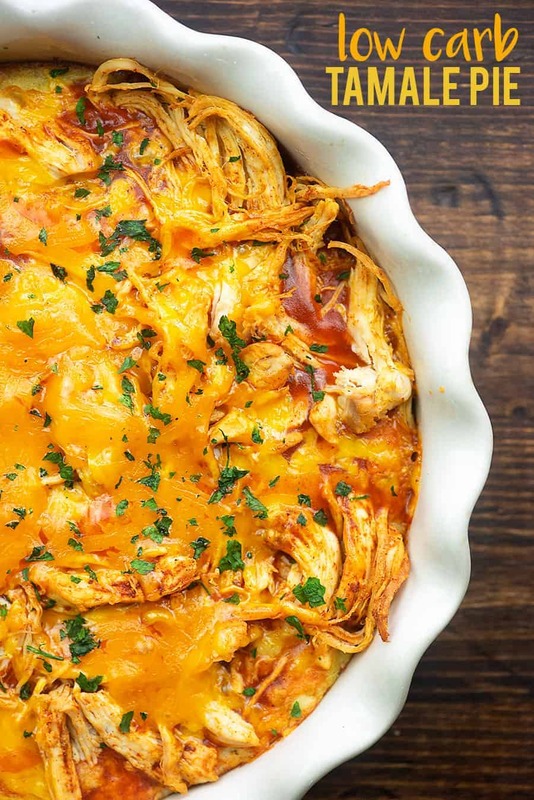 Low Carb Taco Casserole: I make this one when I’m craving nachos! Cilantro Lime Cauliflower Rice: Perfect side or for making burrito bowls! Hasselback Chicken Fajitas: So much fun! Low Carb Taco Soup: The perfect bowl of soup! 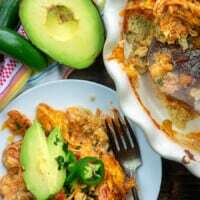 Tamale pie made with ZERO corn! You won't believe how much this tastes like the real deal! 8 net carbs per serving. Preheat oven to 350 degrees. Spray a 9 inch pie plate with non-stick spray. 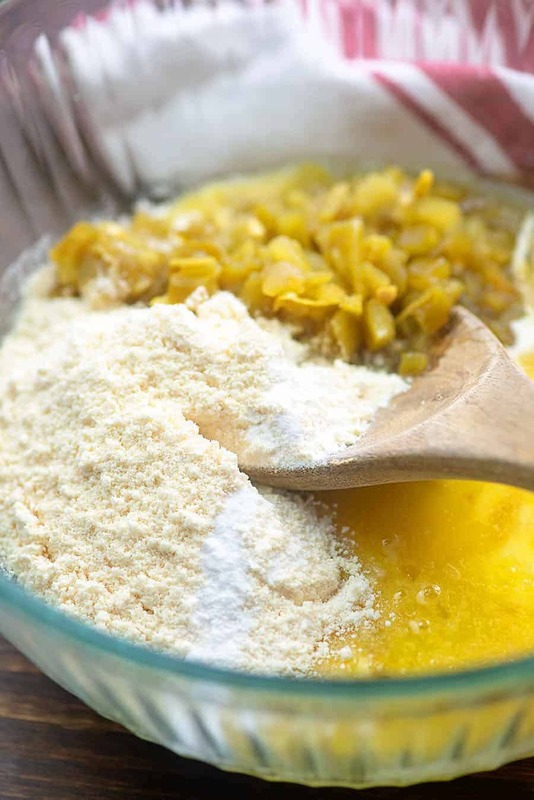 Add the green chiles, coconut flour, sugar substitute, salt, and baking soda to the bowl and stir well to combine. Spread the mixture into the prepared dish and bake for 15 minutes. The cornbread should be just set on top, but still somewhat jiggly in the center. Use a fork to poke holes all over the cornbread. Drizzle the top of the cornbread with the enchilada sauce. 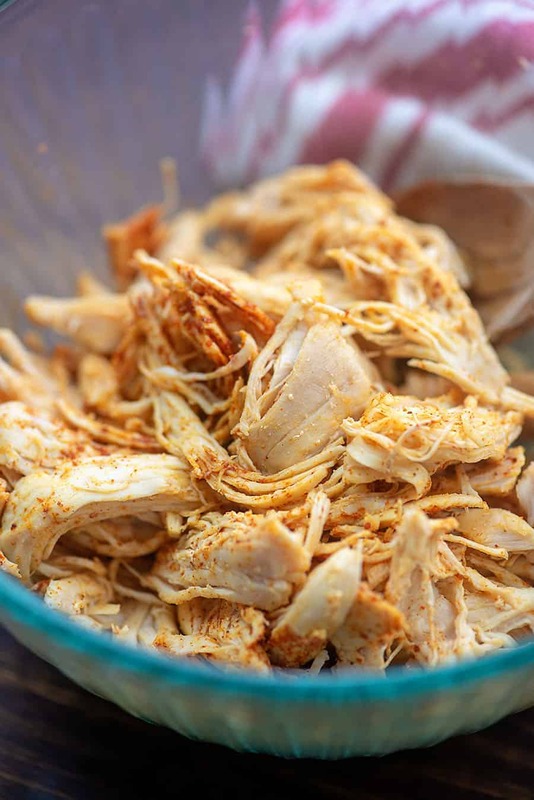 Add the cooked chicken and taco seasoning to a bowl and stir to coat. 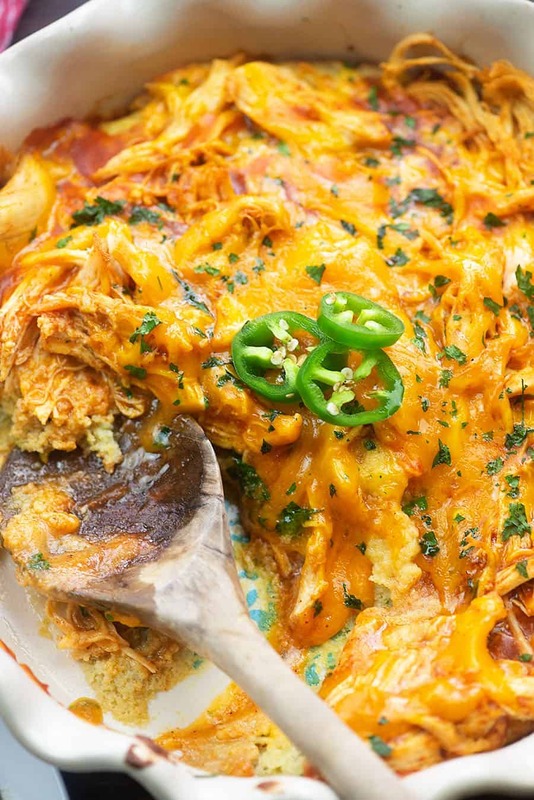 Arrange chicken over the top of the cornbread and sprinkle with grated cheddar. I used Old El Paso enchilada sauce which has 4 grams carbs per 1/4 cup. I drizzle everything Mexican with Cholula - it's my favorite hot sauce. Haven’t made this but it’s what for dinner tonite! Looks yummy, adding a few chopped/sliced black olives. OMGsh! I can’t wait to try this! We should take stock in Tequila Cuervo La Rojeña because we literally put Cholula on EVERYTHING. LOL! Mexican food is my favorite also! 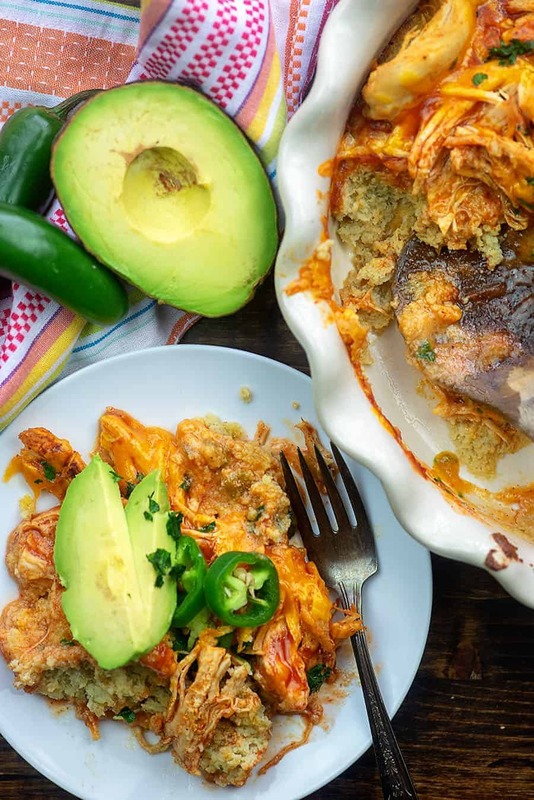 And Tamale Pie is close to the top of the list when it comes to Mexican food so this makes me happy! I almost wish I didn’t have dinner all ready to go tonight so i could try it out. Tomorrow tho. Really looks & sounds good, thanks! I must try this! But I’ll use my homemade chile (chee-leh) sauce. I only use Barker’s chile pods from Hatch, New Mexico. They come in mild, medium, hot, & extra hot. Each pod has 6 carbs g 3 grams of fiber. Soak the pods to soften. Place in blender, add 3 cups of liquid, garlic, & salt. Blend on high & only add more liquid if needed. It should be like a thin gravy but not watery. If too coarse, strain the chile. There’s your sauce. ¡Eso sí! You’d have to adjust the amount. I haven’t tried it myself. Made this for dinner last night, it was great! Picky husband ate it and took a 2nd helping! From him that is great praise. I was so excited to try this last night. Unfortunately, hubby and I were not a fan. It was a little to mushy for us. We ended up scraping the chicken and cheese off the top. Tried last night. Little sweeter than I expected but was good otherwise. I found an enchilada sauce with the name of La Victoria that has only 3 carbs. I found even that to be too sweet. However, overall I really liked the recipe and will make it again without the sweetener. I’m never sure in these recipes when it calls for the sugar substitute is it actually 2 tbsp or the equivalent of 2 tbsp? 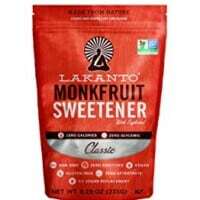 It’s the measurement of the sweetener, not the equivalent.